There are literally hundreds of ways to make money with your blog. I’ve mentioned the overall idea as a reason to start a blog in a previous article. But how can you actually make money with your blog? We’re going to look at affiliate marketing and affiliate products as a means to do it. This is an introductory article to affiliate products and affiliate marketing as a means to monetize your blog. Affiliate products are everywhere and if you can’t find them then join an affiliate network. I explain what an affiliate network is and how to join then how to use the links they give you. Ok. Sound like you want to read and learn about this? Let’s get started. To promote a product using affiliate marketing, you’ll setup an affiliate link to certain product or products related to the topic of your blog and invite your readers to purchase the products. Don’t worry, I’ll explain it all next. This is why we recommend you stick to a generally central topic or niche when you start your blog. It will be easier to find a related product. As you can read in my disclosure, some of the products I recommend on this blog are affiliate products and may pay me a commission if you end up purchasing them. I’m promoting those products as an affiliate (affiliate marketing), using my blog as the means to do so (content marketing). Another disclosure. Traffic is everything, I am not promising a million dollars, but I have done this now twice with two new blogs and generated at least $600/month with each one. Both blogs are growing and at times they’ll generate $1,200 or more in one month. But I only see the income increase when my traffic increases. On a third blog I make more than this every month. Making money through blogging works and this is intended to give you an insight into one way of achieving that. As I grow this blog, you’ll see more articles that help you grow traffic to your blog in the blog promotion section of the blog. Until I grow that section, in very brief, to increase traffic, I use social media and email. So How Do I Start Using Affiliate Links in My Blogposts? I’m assuming you know how to create a link now, on your blog. Your WordPress blog should have some posts and at least a few customizations. Read What to do next? if in doubt. You’ll need to know how to type a blogpost and highlight some of the text to convert it into a link (creating a link). I also recommend you use the Thirsty Affiliates Plugin to help you manage this whole process. If you do things right, you’ll find yourself using that same link a few more times at least, this is why it’s good to manage it with a plugin like Thirsty Affiliates. With those basic requirements out of the way. What we’ll do next is find a product or service, get the affiliate link (unique to each person) and use it to promote said product in the blog. To do it, you just type up your blogpost, add pictures or video as you normally would but use an affiliate link to the product or service instead of using the regular link. How do I find Companies With Affiliate Products? There are many ways you can try to find affiliate products to promote on your blog. The very most basic and easiest one is through Amazon. Amazon has one of the oldest affiliate programs on the web. You can join that here: Amazon Associates. But Amazon isn’t the end all, be all. In fact their commissions tend to be low unless you start selling a lot of products which isn’t unheard of but it isn’t the easiest thing to achieve either. One of the ways to find products you can promote is to just look around your blog and see what type of products and services your audience is using. If you are just like your audience, then you can start at home, or on your own business. If an obvious product or service is clearly the winner then look up the company or competitor or a series of companies in the industry. Example, I googled for “adidas affiliate program” and in one of the top results I found that Adidas has an affiliate program through Shareasale (more on this coming up next). See screenshot. But if you notice in the search results, there are other places you could join to participate in promoting Adidas products and get paid a commission. * All brands are owned by their owners. Only mentioned here under Fair use to educate. But let’s talk about affiliate networks next. What The Heck is An Affiliate Network? An affiliate network without getting into all the gory details, is an online network of sites offering their products and services for promotion under one managing company. Everything works in a performance basis. If you perform, you get paid, if you don’t, you don’t get paid. You only have to join that one affiliate network company, the affiliate network that has the product or service or brand that you’re looking for. There are a few notable networks out there that have most of the best offers. Take a look at these and join them all for free just so you have access to their brands and products. Shareasale is the first one I would recommend. This has a good mix of digital and physical products and great tools for you as an affiliate. Some of the products I promote are part of the Shareasale network and they perform really well. – Remember the Adidas example above? That was this company, Shareasale. Click here to check them out and join. 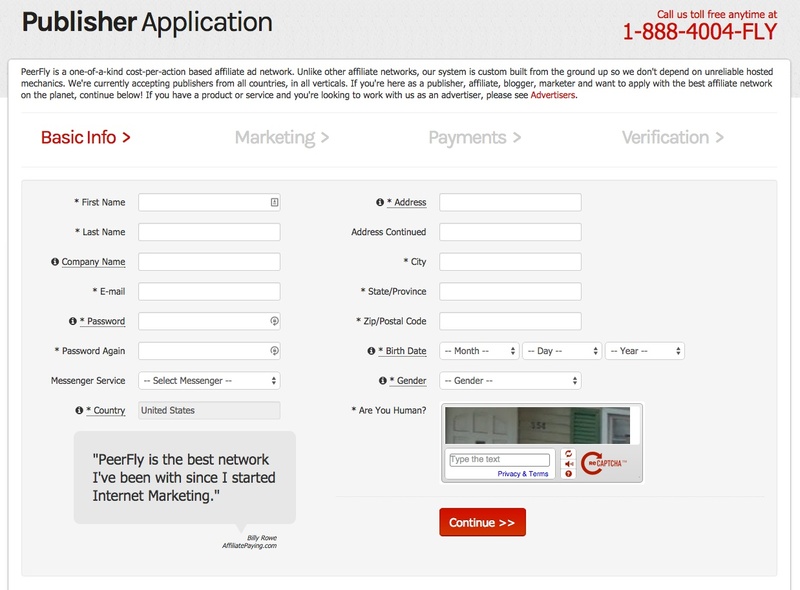 PeerFly is mostly a CPA network. We can cover that later, but CPA stands for cost per action. This means that the advertiser pays money only when an action is completed. Like filling out a survey, or a form, ordering a sample. That sort of action. Click here to check out Peerfly and join for free. Clickbank is another popular one. Totally devoted to digital products. Easy to promote products and most of them have high payouts. it’s not unusual to find flat rate payouts at over $100.00 and commission percentages of 100% of the sale. Click here to join Clickbank. CJ Affiliate by Conversant – This has a lot of big name brands that offer an affiliate program exclusively through CJ.com Many of the companies in here are globally recognized brands. Click here to apply for CJ. Those are just four of the major networks out there and more or less what you would call general purpose networks for affiliates to get started with. I added a good mix of digital products, physical products and special cpa products so you can learn more about the industry and about the business as you find your niche products. And see if that gives you any good results. Of course, you’ll replace the word “industry” with your own, like “photography” or “fashion” or “home repair” or “law”. Join the four networks I listed above first. Those are “must haves” because combined, you will have almost any type of product imaginable. Then you can look at networks that attract your attention or the ones that have products aligned with your niche. In the case of one of my blogs, the topic is parenting and it revolves around me as the dad and my interactions with my family and our adventures. Then you can look for products and services that will benefit the readers (presumably other parents). So I look for parent gadgets, educational toys, things for my wife, and other parenting/family related products or services. Anytime I blog, I see if any of the places or products I mention have an affiliate product and I use it. I’ll look everywhere, then I’ll look in Amazon and use it if it’s the last resort. The only reason I don’t like Amazon too much is because the cookie period that I mentioned earlier is only 24 hours. Blah! How Do You Join an Affiliate Network? Joining is easy, the application and approval process takes anywhere from moments up to a few days. I recommend you have at least a dozen solid blogposts on your blog before you apply for an affiliate network as a blogger or publisher. Most applications have more than one step. This is step 1 for Peerfly. I also recommend you use a professional email address and not a free one like the ones provided by yahoo, gmail, or any other publicly available free email. The best tip is to use something with the domain of the same website you’re applying with. In the application form, you’ll need to fill out all your information and sometimes this includes a social security number or tax ID. Have that handy and realize that you’ll need to provide that to have a successful experience with affiliate marketing. I’m not going to walk you through all the application processes because they are pretty self explanatory. Just fill out all the required fields and follow the instructions. So How Do I Get Affiliate Links? An email outlining further instructions and your access information for their website. A link to a dashboard where you can get stats and your assigned links to promote the products. A link to the product you can promote right away. I would love to show you how to get the links for each of the programs out there but they differ so much that it would require that I create one tutorial for each one. I may get around to do that soon, but in the meantime read through the tutorials provided by each network and the support documents from each network. My goal when I look for products that I may want to promote is that they have a high payout and a high price but high value too. They must offer a high level of value in general terms but also specifically to my audience. In the affiliate dashboard, you will usually find a link to “your links” or “banners” and other resources that help you promote the products. Here are two screenshots from two different dashboards that I work with regularly. I marked hot areas and explain them after the screenshot. You’ll see other dashboards are different but pay attention to my notes, that’s what you’re looking for. The links help you get around, back to the affiliate dashboard is (1), then if you want to see how many clicks you have had you’d check “latest clicks” (2). In this case, this affiliate program tracks sign-ups as sales so it’s another thing I can look at (3). The rules, and FAQ are for your education as an affiliate (4 & 5). You should always read and follow the rules on each network so you don’t get banned. This program also has a quick announcement area promoting their program (6). By the way, this program is from the leaders in WordPress and web security Sucuri. Yes, they even have an affiliate program and it pays 25%. To use the links, you start by copying them and using them on your blogposts. I blurred out my affiliate ID but this is again, for Sucuri. The main thing is to find your main affiliate link. In this case it is the first link highlighted. That means I will get 25% of anything a customer buys after they click on that link. But that link looks ugly! So you simply take that link and put it into a blogpost in your blog. In this case, you would write about about how great Sucuri is and what type of services it offers and then offer a link for people to click more and learn more. That link will be your affiliate link. To make it look better and not so ugly, you would use the link button in WordPress or better yet, use Thirsty Affiliates like I indicated earlier and that will make your links look a lot better. Here’s an example of a link that is managed with the Thirsty Affiliates Plugin. Very important question! Most of the companies I deal with pay me via Paypal, or with a check. But I have a few other companies that have their own method of paying and I just go with it. But most will offer Paypal or Check. You may need to reach a certain amount in sales, like $50.00 before they send you payment or something like that. Often times you can adjust this if you go through your profile and look for any settings you want to adjust. Regarding payment, you’ll also notice that most companies require a tax form (US, Canada and UK? ), to be filled out before they issue you payment, this is where you’ll need your social security number or Tax ID. Just get that done quickly and you’ll be on your way. Use an ad manager like OIO Publisher to try different ads for affiliate products on your sidebar. Look around your place of business or your house and blog about the products and services you use on a daily basis for home or work. Don’t just blog once about one product. Blog about the same product a few different times and highlight different aspects of it. Features, reviews, pros & cons, personal experiences and more. Don’t spam. Don’t over do the links. If you have given value on a blogpost then you are safe to use an affiliate product in the post. 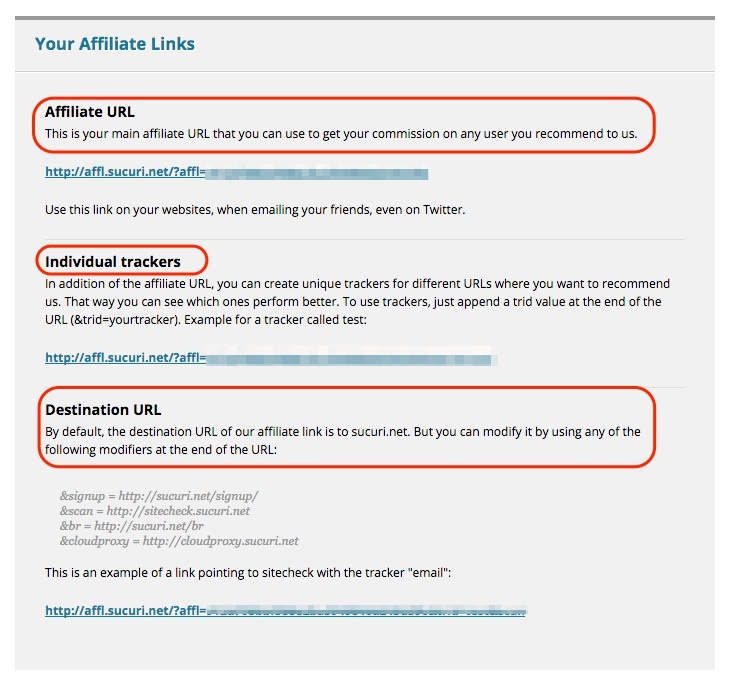 Other ways you will find links in your affiliate dashboard is by creating them. Some affiliate programs have unique links created on the fly for you.You’ll need to follow the instructions on their affiliate dashboard to obtain your link. You can create special links to specific pages within a product or website so that it fits into your blogpost’s narrative better than just the home page. Just keep your links organized in Thirsty Affiliates. If you don’t want to use the plugin Thirsty Affiliates, then you can use Evernote or another note application to keep your links handy so you don’t have to keep logging into your dashboard just to get your link. I recommend you login to your affiliate dashboard every few days after you start promoting a product to make sure you’re clicks are getting recorded and hopefully you’re making sales! Always add value so people trust your advice when recommending a product. The blogpost where I recommend 7 themes for bloggers, has affiliate links in the post. If you were to pick one of those themes as a theme for your blog and use the link I posted to get to it when you buy it then I’ll get a small commission. My value-ad is that I put together a list of themes that would help beginners pick from hundreds of available themes out there and save their hard earned money. I help them focus on a few themes that I trust and in the same way, and this way I can make a few bucks each time someone follows my advice. Join the 4 affiliate networks I mentioned earlier. Search the affiliate networks for products that relate to your blog and see if any of them interest you. Blog about said products in your blog. Create a story around the product. If you own it, do a review but with a story. If you don’t want to go with the affiliate network route then find relevant products by using Google searches. Start blogging with affiliate links and start getting paid!